Value By Design with Australia’s Most-Recommended Provider1. With over 70% of Australian IT budgets already consumed by legacy costs2, freeing time, money and talent for what comes next is crucial. For 91% of Australian organisations, the answer is a multi-cloud solution2. While this approach can put each workload in the right place, it can also open the door to variable billing and complexity. Up to 80% of organisations utilising the Cloud are paying for services they do not use as a result3. We’re different. For 17 years, we’ve built on our Telco heritage to serve teams being overcharged and underserviced. We’re hundreds of people, with thousands of solutions. Over here, not over there. Let’s talk. We use a 5-point framework to deliver Colocation, Hybrid and Private Cloud solutions to meet your performance and budget goals today. And tomorrow. Control your Cloud Computing costs. No surprises when you receive your bill each month, you'll be billed only for what you use and will be notified if we notice your usage increasing. No two companies start from the same place or have the same goals. 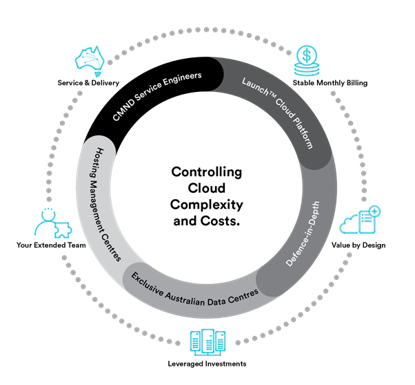 Leveraging our own Telco and Cloud Security capabilities, as well as Data Centres and CMND engineers, means we can deliver the right design for your goals. Our Zero-Downtime Hosting doesn’t require you to choose additional costly zones to deliver High-Availability (HA) performance. We enable you to simply oversubscribe your existing VM’s to avoid new VM spin-up, configuration and spin-down risks with horizontally scaling public cloud providers4. We simplify your licensing complexity and costs by design e.g. unlimited windows licenses at a Virtual Data Centre (VDC) level. We empower you to select the self-managed or fully managed, shared or dedicated design that’s right for you. In some cases, 'noisy neighbours’ on shared infrastructure can mean anything from 1.5 to 5.7X as many shared assets are required Vs dedicated assets for the same workloads5. You worked hard for what you have in place. Bring it with you. By sweating your existing assets in colocation, you can secure enterprise-scale efficiency and free resources for your priorities. Our solutions, such as 100% SLG Active-Active designs, prevent you having to re-architect apps. And our stretched VDC solutions seamlessly apply your existing IP addresses and security zones. IT talent costs are spiking over 8% p.a. and accelerating6. Because we offer flexible design, named local engineering talent and use the open VMware tools you already know and trust, we can help free you from escalating recruitment and retention challenges. We don’t believe enterprise-grade service should be an at-cost, offshore option. If things happen, they can often be urgent and technical. It’s why local, named CMND and Hosting Management Centre engineers are in place 24x7 to deliver on our Personally Accountable Service culture. Our real-world plain-language SLG’s mean you get what your pay for. Our open tools such as MacquarieView give you the tools you need to manage your environment, easily. And our plain-language contracts deliver a no-surprise experience. At Macquarie Cloud Services, we believe in delivering value by design. It’s another reason we’re Australia’s most-recommended provider. We’d love to show you just what we can deliver you. It can all start with a single coffee. Let’s talk.